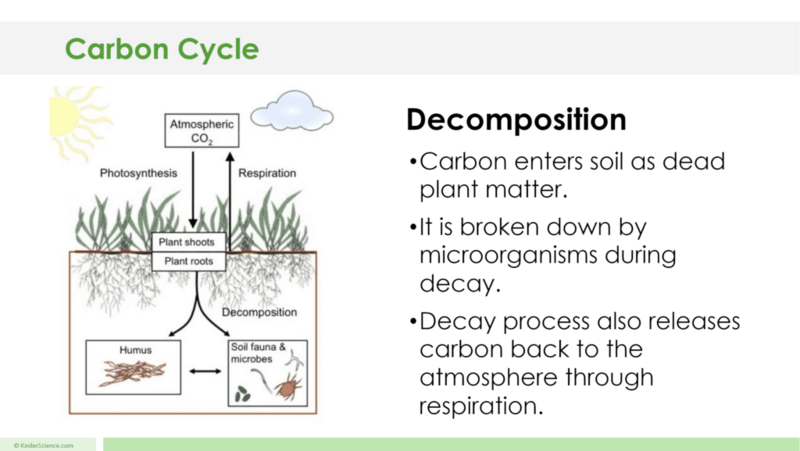 At the end of this carbon cycle lesson plan, students will be able to define and diagram the biological and geological carbon cycle. Also, they will be able to interpret how carbon flows through the geological and biological carbon cycles. Each lesson is designed using the 5E method of instruction to ensure maximum comprehension by the students. 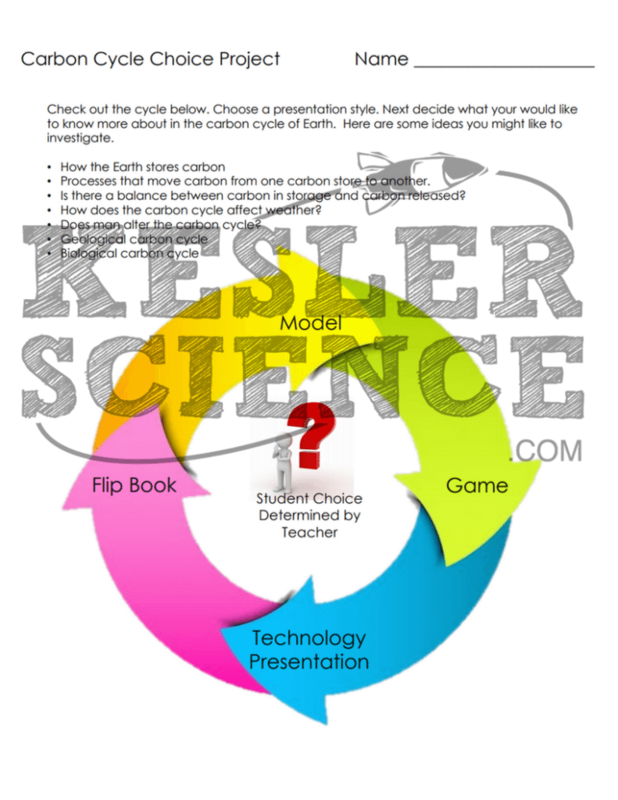 The following post will walk you through each of the steps and activities from the carbon cycle lesson plan. 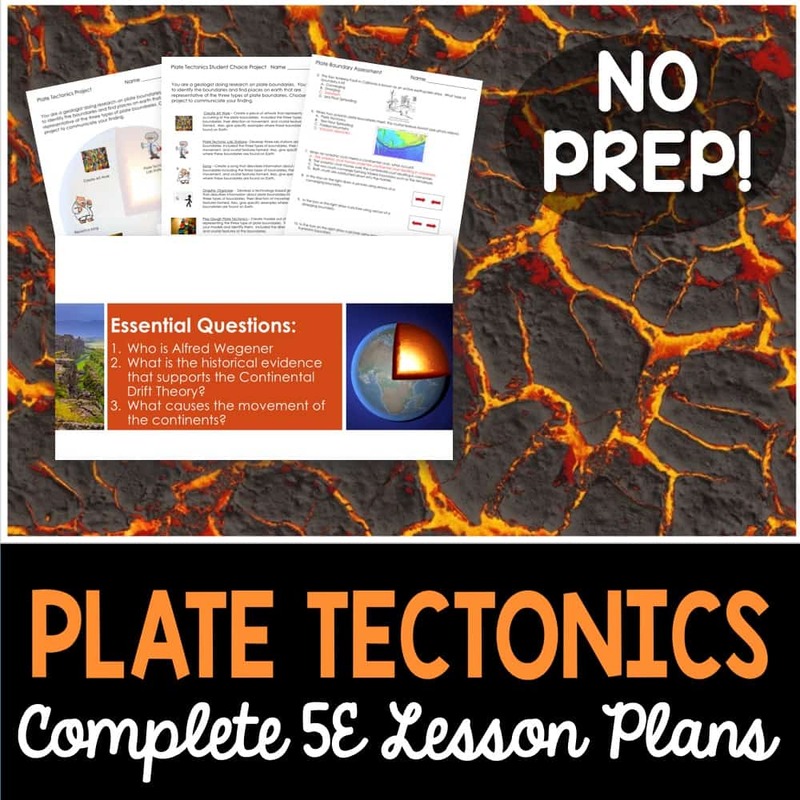 Join nearly 40,000 middle school science teachers and gain access to the complete plate tectonics 5E lesson. Ask students what they already know about carbon. In what forms is it found on Earth? Show the YouTube video – “The Carbon Cycle of the Circle of Life”. Students watch the video using the provided link. 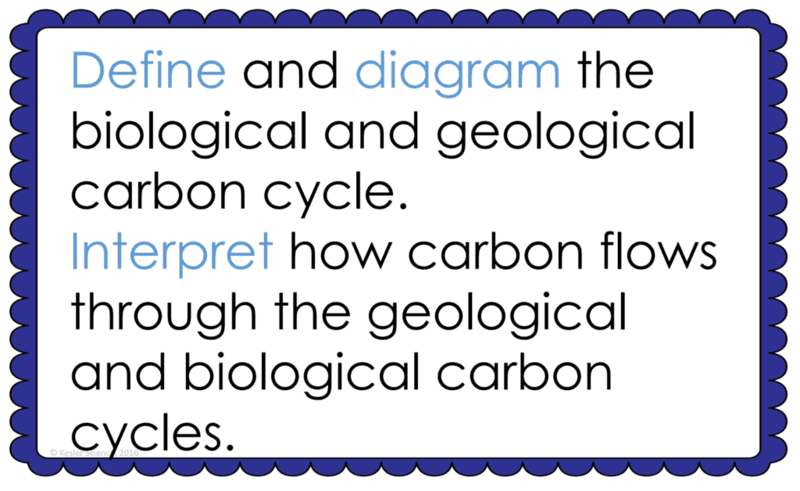 Discuss the components of the carbon cycle. Give students 10 minutes to discuss and write about what the carbon cycle might look like in their location. The teacher will help to clear any misconceptions about the carbon cycle. A major misconception is that students don’t understand that the carbon cycle is more than one simple cycle, but many cycles that work together to balance the carbon on Earth. 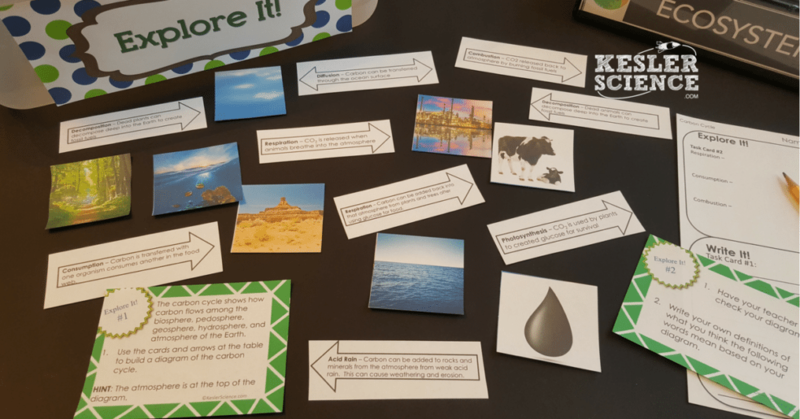 This student-centered station lab is set up so students can begin to explore the carbon cycle. 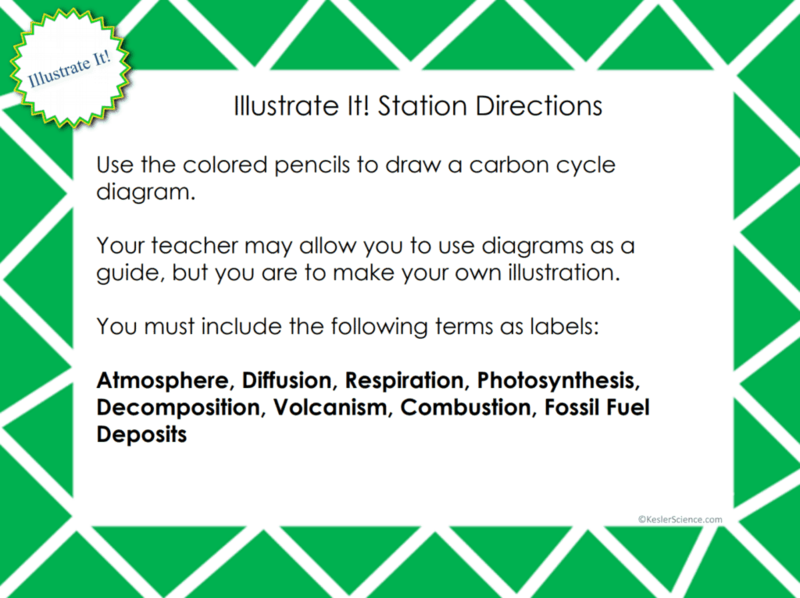 Four of the stations are considered input stations where students are learning new information about the carbon cycle and four of the stations are output stations where students will be demonstrating their mastery of the input stations. Each of the stations is differentiated to challenge students using a different learning style. You can read more about how I set up the station labs here. Students will be working in pairs to better understand the carbon cycle. In this station, students manipulate cards as they try to match up a picture to the factor within the carbon cycle. Students will follow the steps and record their observations on their lab sheet. At this station, students will be watching a short video explaining the carbon cycle. Students will then answer questions related to the video and record their answers on their lab station sheet. For example: Explain the process of combustion. How are combustion, respiration, and decomposition similar to each other? What are some processes that take CO2 out of the atmosphere? 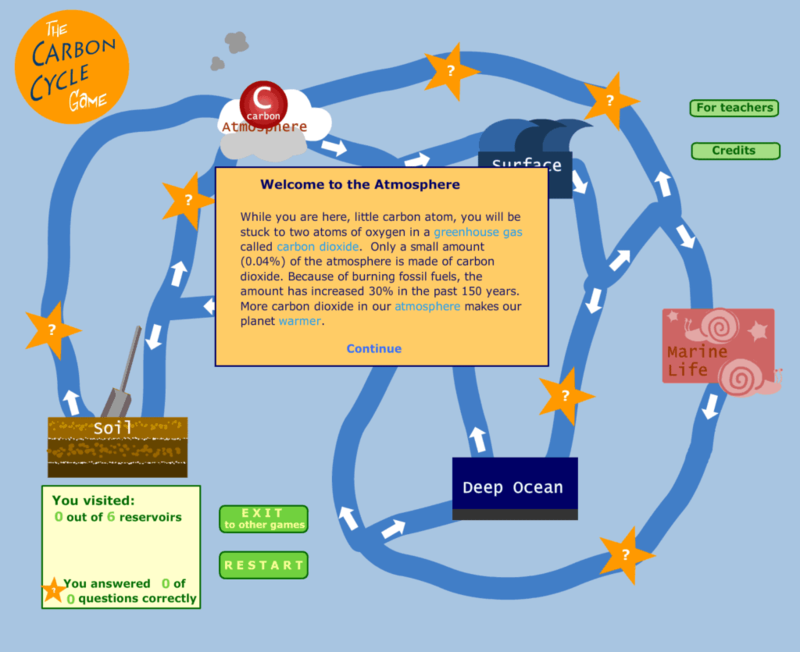 The research station will allow students to explore an interactive web page that helps them to understand the carbon cycle by playing a game. Students will be instructed to complete a few tasks and record answers on their lab sheets. This station will provide students with a one page reading about the geologic carbon cycle. There are 4 follow-up questions that the students will answer to show reading comprehension of the subject. The assess it station is where students will go to prove mastery over the concepts they learned in the lab. The questions are set up in a standardized format with multiple choice answers. Some questions include: Which is an example of respiration? What role does photosynthesis have in the carbon cycle? Which process(es) add CO2 to the atmosphere? The burning of fossil fuels adds CO2 to the atmosphere. What is this process called? Students who can answer open-ended questions about the lab truly understand the concepts that are being taught. At this station, the students will be answering three task cards: Explain the role of photosynthesis in the carbon cycle. Describe two scenarios where respiration can occur. 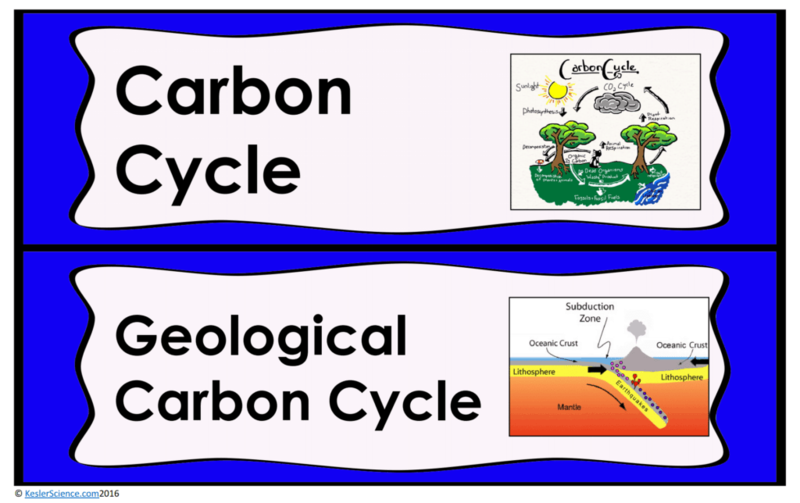 What is the difference between the geological carbon cycle and the biological carbon cycle? Your visual students will love this station. Students are to draw a picture that demonstrates their knowledge of the carbon cycle. Their drawing will have labels such as atmosphere, diffusion, respiration, photosynthesis, decomposition, volcanism, combustion, and fossil fuel deposits. Students at this station will match the sets of cards. Sets include a carbon cycle factor with the description. Once students have completed their organization, the teacher will check their understanding. The explanation activities will become much more engaging for the class once they have completed the exploration station lab. 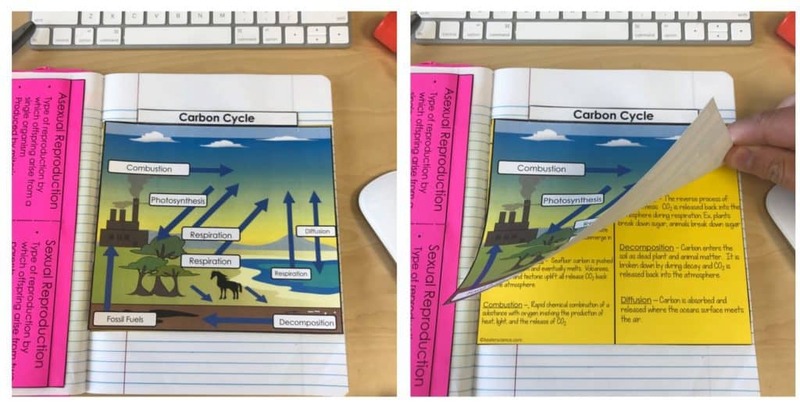 During the explanation piece, the teacher will be clearing up any misconceptions about carbon cycle with an interactive PowerPoint, anchor charts, and notes. 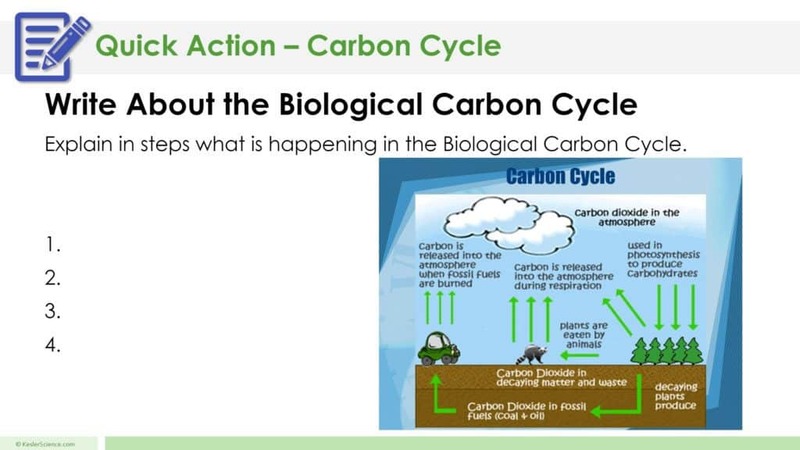 The carbon cycle lesson includes a PowerPoint with activities scattered throughout to keep the students engaged. The students will also be interacting with their journals while taking notes from the PowerPoint. If you have students that need modified notes, the 5E lessons come equipped to help give every student access to the lesson.